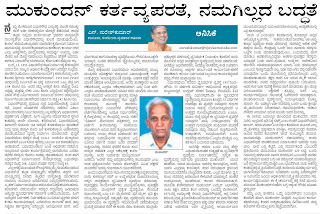 This is another article appeared in today's Vijay Karnataka.. Commitment to your work matters however tiny your responsibility might be. Here is a person namely Mukundan who is one such example. We have so much to learn from him! Its realy proud sir, thank you for written abt him and his work. If the all govt emploies has the same quality and working spirit of MUKUNDAN i think India will be bribeless country. 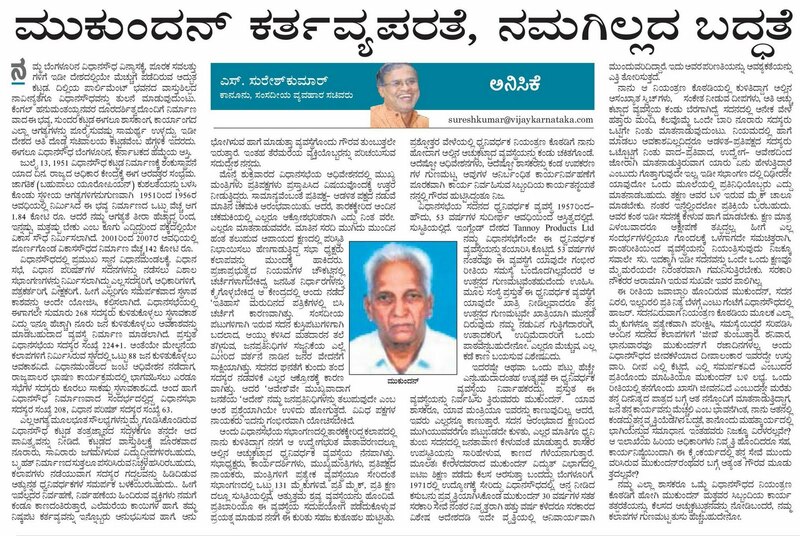 Dear suresh avre,im observing u frm the day u were writing articles to vijaykarnataka before this gvt also...i realy appreciate the way u r..cz its very easy to write n to preach bt realy difficult when it comes to prove...u r the model for others to copy at the present situation..good luck suresh ji.. I am Suresh kumar.N from Mysore, I really thankful to you sir because of the progressive works are going on. Really am proud of getting humanitarian person we have. best manthri, best human,anta, nanu thilidukondiddene ? nanna patrakke UTTARA villa ?